The ice wall will tower over Superior. 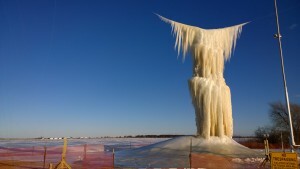 Starting in 2007, “Iceman Roger” Hanson has been constructing ice walls in his backyard before having the opportunity to showcase his work at Barker’s Island located in Superior, Wisconsin. As a mechanical engineering, electronics engineer and software developer, Mr. Hanson has earned the skills and knowledge needed to develop the equipment necessary to create these massive ice walls. Robots are used to direct the spray of water across hanging cables which freeze and form tiers. Hanson builds these tiers on top one another until the desired height is reached. Now that he has the system running how he wants, the computer can take over the responsibility of building up the ice. Hanson stated that many challenges have arose while launching the Lake Superior Ice Project: “anchoring the towers through all the construction debris, getting proper water supply from the St. Louis River and not understanding actually how soft this man-made island is.” After three trials Hanson was successful in forming the base of the structure and has since built multiple tiers on top. When he first started, he spent approximately 18-20 hours a day working on this ice project. Since then, Hanson spends less time in development and more time in overseeing the computer-controlled robots. Once the ice wall is completed he hopes it will stand at 70 feet tall and 50 feet wide which would make it a world record size. The ice wall is taking shape! The Lake Superior Ice Project can be viewed at any time on Barker’s Island. Watching the ice wall grow is an exciting part of the Lake Superior Ice Project experience. The National Bank of Commerce is bringing Children’s and Family Light Shows to Barker’s Island Festival Park on February 14th and 21st. National Bank of Commerce is adding fireworks to the light show on February 28th. Click here to visit the Lake Superior Ice Project website. It has been incredible watching the Ice Project grow down at Barker’s Island. The Development Association is thrilled that the City of Superior, especially the Parks and Recreation Department, was able to bring the Ice Project to Superior. We have been involved in the Lake Superior Ice Project because we believe that projects like these play an important role in promoting our area and building a sense of community. We are excited to see what the future holds for Superior!